The Microsoft Dynamics GP 2018 R2 update is fast approaching. Several users and developers have started highlighting key features and updates that are new or improved from previous versions of GP. Today the feature is monthly recurring batches for receivables, payables, and inventory batches. For monthly and bi-monthly batches a box has been added labeled “Use last day of the month”. 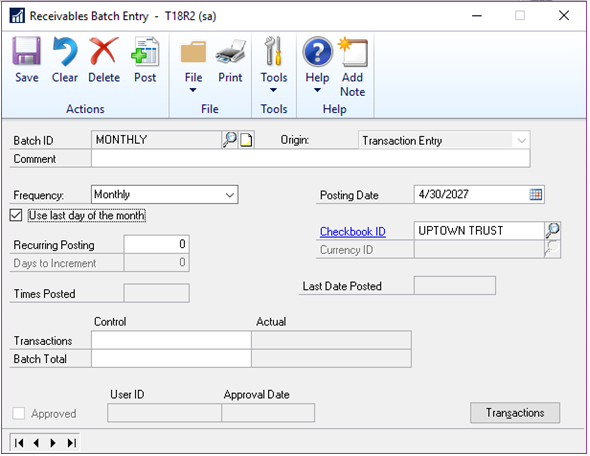 This checkbox will allow the date of the batch to be set to the last day of the month. This new feature fixes the posting between months that have 30 or 31 days by altering the post date based on the calendar month itself. Content originally posted on the Microsoft Dynamics Community! Let us help you upgrade your GP system! Give us a call at 855-913-3228 or drop us a line at info@altavistatech.com to learn more about upgrading and what is needed to move forward. We take pride in being part of your solution.